Center and Golda Meir Center. the Golda Meir Center, 302 S.
vices to the very bone. eat in shifts, even on Shabbat. Go There For A Visit Now! of Congregation B'nai Israel said. of Temple Ahavat Shalom said. the Israel Ministry of Tourism. there's no better place to go. good reason to question security,"
tionally, overseas and in Israel. to give them the opportunity,"
as a plus gift to her husband's. the Mny years of the struggle for My freedom. thanks to each of you personally. to leave must be given that right. TOGETHER WE WILL 00 IT. MONDAY, 17TH FEBRUARY 1986. JERUSALEM, ISRAEL. DID YOU HELP MAKE THIS POSSIBLE? If not, it's not too late to help others. or the volunteers in the office. ing are also giving of themselves. making a statement to the world. members of "Players of Pinellas"
and John Fritz, Curt Mayer. themselves to the life of the land. that to please a royal favorite. to keep it alive and well," he said. show Israel that we care. Israel Ministry of Tourism said. His involvement in human history. tion may he hope for Divine help. will further support such efforts." loved one into a nursing home. as they too grow old. frustrations that they deal with." The entire community is invited. preparation for the Science Fair. investment in Israel and tourism. Ira Youdovin, Temple Beth El, St.
ly or indirectly from tourism." tions are encouraged to call. Star Wars: A Nuclear Security Shield? tyrants who plot our destruction. every country and every age. the punishment of the instigator! All the elements of a great story. frustration ana fate of Haman. cable Friday to President P.W. rwu.1 snwaiwhla pteog* to Jowt.h Fodorttion a* flMllI Comity tor Mch Ih. turn ol S2.2S ..
oM. Out Of Town Upon ftoooott. challenge and went to the moon,"
various aspects of the program. Many people are moving there. Alto in California and elsewhere. Australia and Israel in the project. not the case with Israel. believe it is genuinely feasible. their hopes are being met. are anxious to cooperate with it. blem, a very difficult problem. simply and very clearly, yes. aircraft from the United States. technologies, such as in optics. novative ideas on the battlefield. first-rate reputations in the U.S.
ding for specific SDI contracts. Israel's inclusion in the project. years since I wrote these words. and isolated in the community. be late for her appointment. provide for her father's needs. the former capital of Galilee. will run from May 31 until July 7.
the Prince, editor of the Mishnah. to self, family and community. Black Hebrews Back in U.S.
and Arts and Crafts Festival." delicacies from around the world. Sunday, March 30. at 10 a.m.
ner on Sunday, March 30 at 5 p.m.
dinner and are due by March 23.
day, March 24 at 7 p.m.
ed by the Reading of the Megilla. Israel, 301 59th St. N., St.
on Tuesday morning at 8 a.m.
Temple B'nai Israel, 1685 S.
a.m., and again at 6:15 p.m.
a charge of $18 per person. test is scheduled for 2:30 p.m.
Snell, Liz Foster and Shari Azar. and under will be admitted free. to come face to face with anxiety. ple to dwell on their worries. Rule No. 1 Keep busy. even if its a walk around the block. the finishing touches with makeup and hair styling. applause for making it such a beautiful evening. treasurer Ronnie Pollack; financial secretary. f60Strikowsky. 28th anniversary with a party at the Dolphin Beach Resort on St.
Fallsvicw activities even tin ire. COME TO ISIMELCOME SWY WITH FRIENDS. us at the Kent JCC at 9:30 a.m.
Passover on April 20 from 2 p.m.
tropical drinks and luscious fruits. Jackee Meddin at 726-5115 or M.
gram coordinator of the Center. save a life in this invaluable class. Brooksville on April 8 and 9.
tion costs to and from Israel. tion deadline is March 1.
stitute of Science, 1550 N.E. Floridian P.O. Box 012973 Miami^Fla. ie soldiers of King Amalek. of Amalek was "blotted . on a slip of paper and erase it! h- How did Purim spiel* start? According to the Talmud, yes. cornered hat which Haman wore. ed as the most popular delicacy. places, is a religious duty. chapter of the Daughters of Zion. 11. Is the story of Esther true? how the book came to be written. pagan carnivals of that era. mood of confidence in deliverance. Zimbler at 347-3236 in Pinellas. in the pool then munch out! the public for the evening. Thursday, March 27. Cover is $8. to pay tribute to a great lady. season with a variety of activities. Sunday, March 23, 2-5 p.m.
is no charge for this program. familiar with relevant U.S. policy. of my own personal views." Worldnet, a program of the U.S.
sin, Connecticut and New York. not deal with policy of the period,! documents the intensity of the! vivors retold over 10 years,! Evening Sabbath Service* 8 p.m., Saturday Morning Sabbath Service 10 a.m. .
Bar-Bat Mitzvah Service 11 a.m. Tel. 347-6138.
at 8 p.M.; Satarday. a.m. Tel. 321-3380. 864-427.
ami Sanday a.*. ; aad evening Minyan Tel. 3H1-4M0. day evening! 8 p.m.; .Saturday. 9:30 a.m. Ttl. 3*3-5525. ***k Friday evening at 8 p.m.; Saturday 10:JC a.m. Tal. 531-5828. Avu.. SW. Largo. Cull 787.3224 (or information. P.O. Boa 1426. Lar,.. 34284-1428 Tel. 584-7784. kubbi Shlomo SawilowAy. Floridian deadline for edition of April 4.
services at Temple B'nai Israel, Clearwater, 8 p.m.
N., St. Petersburg. 8 p.m. Donation: $7.50 per person. Food, games for the entire family, disc jockey. Admission: $1. JCC Purim Festival. 12:30 p.m. until later afternoon. Festival and International Food Fair, 9 a.m. to 4 p.m.
Reading. 5 p.m. Carnival and supper 5:30 p.m.-7:30 p.m.
JCC Senior Friendship Club Purim party. Golda Meir Center Purim Party, 1 p.m.
B'nai B'rith Women general meeting. Close Harmony will be shown, JCC. St. Petersburg, noon. Hadassah Aliyah Group board meeting. rwo Conflicting Jewish Views." 8 p.m. In Temple sanctuary. JCC Senior Friendship Club Birthday and Anniversary Party. Brandeis University National Women's Committee. St.
Preston, St. Petersburg Beach. 5 p.m. Cost $8. Center, Tampa. 7:30 p.m. Free. Golda Meir Center CPR Class. 1-4 p.m. Fee: $7. Allocation Committee meeting, 6:30 p.m. Golda Meir Center. more information, call program chairman Jeff Donsky. Brandeis University National Women's Committee, St.
Ty Sobelman 567-8207 for reservations. JCC Senior Friendship meeting. Election of officers. 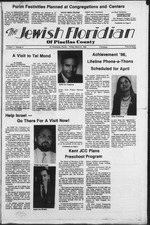 Floridian Deadline for April 18 edition. ble, with a shotgun start. lunch at Chuck E. Cheese. popular Yoga classes at the JCC. PRE NEED CON ATION AND PRE PAID. Shushan," a story about Purim. for chldren with special needs. 11 (first session) and July 14-Aug.
list, call the JCC at 344-5795. Starting April 27th Pan Am Will BeTaking Off Every Day For Tel Aviv.